Anyone who’s seen news footage of the monstrous Station Fire and other Southern California wildfires can appreciate the heroism and bravery of the firefighters who have been battling the blazes. Two of them, L.A. County Fire Capt. Tedmund “Ted” Hall and firefighter Specialist Arnaldo “Arnie” Quinones, were killed as they tried to find an escape route for 55 inmates at a corrections camp in the Angeles National Forest. This Wednesday, September 16, Bottega Louie and TRU Organic Vodka invite you to Cocktails for a Cause, an event to support Los Angeles firefighters. TRU is providing tastings of the Red Engine cocktail, made with TRU Organic Vodka, CRISM Organic Hibiscus Liqueur, and lemon. Bottega Louie and TRU will donate $1.00 for every Red Engine cocktail served. 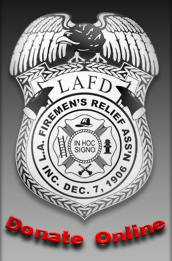 Proceeds benefit the Los Angeles Firemen’s Relief Association, which offers programs to provide assistance to firefighters and their families. These programs include the Fire Medical Plan, Relief Fund, Life & Accident Fund, and the Widows, Orphans & Disabled Firemen’s Fund. For more information, or to make a donation online, please visit the LAFRA website.